She came to our coffee meeting with a slow pace and a gloomy face. It was not her style to put grey nail polish, and to wear a black shirt in the middle of a hot day. We were pretty anxious even by the way she pulled her chair and fell on it with a sigh. “I’m not feeling well“, she murmured. What a surprise! Seems like our most memorable conversation comes when one of us in need for a shoulder to cry on, and -less dramatically- a listener to analyze the haunting voices inside our heads. We refrained from our usual caffeine dosage, and ordered 4 Vanilla Chai, hoping that this aromatic drink will help us in our delicate endeavour. We let her take the steam out of her concealed heart. She kept talking and talking, not with a complaining tone, or blaming anyone else for her black thoughts. Just like any woman in emotional distress, she just needed someone to listen. The image of the girl beaten up ferociously is tapped in my mind. Was it fun for you, you *#$%^& ? And thank for for getting back to cover the poor girl after beating her with batton and step on her with your filthy feet! Every time I see one of you, I will remember this woman. Every time your council comes on TV for some oops-we-‘re-sorry press conference, her screams will ring in my ears. They exceeded the level of Abo Lahab himself! After seeing the part of the Tahrir Woman herself, I got to notice ANOTHER horrific beating! Notice at second 59, there is a man and a woman wearing red pullover and red headscarf walking, then at 1:23 she’s standing in front of the man pointing at the girl, then at 1:39 there is an officer shooting with a gun towards the demonstrators, and at 1:43 they push her on the ground hitting her with their filthy boots! FILTH!!!! In this time of turbulences, the last thing we need is pessimism, there is much work to be done, and so many troubles to be solved. Generally, on this blog I don’t want to talk about politics, there are so many opinions, views, hidden facts, and conflict. That’s why I needed some change, fresh air, I simply needed a story of inspiration. And I was very lucky to get to know the name of a woman who changed her destiny, and found happiness despite the surroundings, and above all this, she was the first Middle Eastern woman to hold the title of Professor!! Her name is Kulthum Odeh كلثوم عودة, she was born in 1892 in Nazareth, Palestine, and was the fifth girl in a family that wanted desperately a boy, so you can imagine with what face they have received her. Added to that her parents kept telling her that she was not pretty, and that she will end up as a maid serving her brother’s wife for the rest of her life مين ياخذك يا سلوله بتبقي كل عمرك عند امراة اخوك خدامه!!! Though these words would ruin any little girl’s self esteem, for Kulthum it pushed her to study more, and back then, the girls who didn’t have good suitors were the only ones to be sent to school. After finishing her primary school education in Nazareth, she moved to the “Russian seminar” collage in the city of Bait Jala. She was sixteen when she finished her schooling, and when returned back to Nazareth to work as a teacher at the Russian Association. During that period an Assembly of inspectors used to visit the schools, they were sent by the Russian society. She started then publishing articles in several magazines such as “Alnafaes Alassryah” in Haifa, “Alhilal” in Cairo, and “Al-Hasnaa” in Beirut. Kulthum fell in love with the Russian doctor Ivan Vasilev who worked at the General Hospital in Nazareth, and they were married 1913 though her parents strongly opposed. And this is something that perplexe me. I understand that getting married to a foreigner is unorthodox, but they didn’t expect her to get married altogether. Plus, she was 22, and through to their standards, she was almost a spinster. Anyway, they fell in love and decided to get married regardless of the many barriers between them, and moved to Russia. After the October revolution and the outbreak of the civil war in Soviet Russia, Dr. Ivan ‘Kulthum’s husband’ volunteered with the Red Army. But he fell ill 1919 by the break of typhoid epidemic and died after 5 years of marriage, leaving his wife and their three young daughters struggling on their own. Kulthum worked the land to provide for her daughters, and continued her academic education assisted by a number of Russian Orientalists, lead by Kraczkowski, who met her earlier in Palestine. She became a lecturer of Arabic language at the University of Leningrad (Petersburg) after she has acquired her PHD 1928. After that she founded the institute of Arabic dialects at the University of Moscow. She was the first Arab woman to hold the professor title! 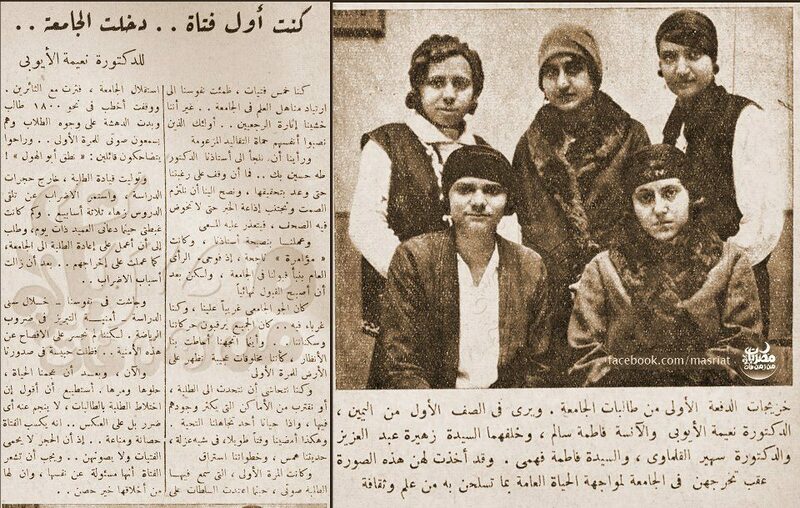 I don’t know how this little piece of info isn’t known for Middle Eastern women..
Kulthum visited Nazareth 1928 and went round Palestine and was welcomed by a number of Palestinian pioneers, thinkers and writers of “Al-saaleek Cafe,” that used to be a forum for Palestinians intellectuals in Jerusalem. Amongst them was Khalil Alskakini, Adel Jabr, Lindly Saliba Aljawzi,and Georgi Halabi. After World War II, Kulthum moved to Moscow, where she continued teaching at the university, and was an active member of the Association of Soviet cultural relations with Arab countries. She won the “Medal of Honour” 1962 on her seventieth birthday, and before that she won two gold medals in recognition of her research and efforts. She died on the 24th of November 1965 and buried in a cemetery for VIPs in Moscow, her grave head stone was engraved in Arabic, and the words translates‘ An example for the living to follow’. Some of the reasons I was very interested in knowing more about her, is the sweetness in some of her words. By chance I found an article she wrote and sent it to El Hilal magazine about happiness (below), I so want to know more of her writings though. لقد استُقبِل ظهوري في هذا العالم بالدموع. وكلٌ يعلم كيف تُستَقبَل ولادة البنت عندنا نحن العرب، خصوصا إذا كانت هذه التعسة خامسة اخواتها ، وفي عائلة لم يرزقها الله صبيا. وهذه الكراهة رافقتني منذ صغري. فلم أذكر أن والديَّ عطفا مرة عليَّ وزاد في كراهة والدتي لي زعمها أني قبيحة الصورة. فنشأت قليلة الكلام كتوما أتجنبُ الناس، ولا همَّ لي سوى التعلم، ولا أذكر أن أحدا في بيتنا دعاني في صغري سوى “يا ستي سكوت” أو “يا سلولة” ، وانكبابي على العلم في بادئ الامر نشأ من كثرة ما كنت أسمع من والدتي “مين ياخدك يا سودة. بتبقي طول عمرك عند امرأة أخيك خدَّامة”. وكان ثمة شبحٌ مهولٌ لهذا التهديد، إن عمتي لم تتزوج، وكانت عندنا في البيت بمثابة خادم. فهال عقلي الصغير هذا الأمر، وصرت أفكر كيف أتخلص من هذا المستقبل التعس، لم أر بابا إلاّ بالعلم ولم يكن سوى مهنة التعليم في ذلك الوقت تُباح للمرأة. وقد كانت العادة قبل الحرب أن من يكون أول تلميذ في المدارس الروسية الابتدائية يتعلم في القسم الداخلي مجانا وبعدها يحصل على رتبة معلم. فعكفت على العمل وبلغت مُرادي. والفضل في هذا لوالدي، إذ إن والدتي المرحومة قاومت بكل ما لديها من وسائل دخولي المدرسة. فهل كنت سعيدة في حياتي؟ نعم. إني وجدت في نفسي خُصلتين هما من أهم العوامل في هناء عيشي: الإقدام على العمل مع الثبات فيه، والمحبة، محبة كل شيء، الناس والطبيعة والعمل. هذه الخصلة الثانية هي التي تساعدني دائما في أحرج مواقف حياتي. إن تذليل المصاعب لبلوغ المراد هو أكبر عوامل السعادة. فإذا اقترنت هذه بسعادة من يحيط بنا أيضا، فهناك هناء العيش حقا. قضيت خمس سنوات بين أولئك البنات اللواتي كنت أعلمهن. وقد أحببتهن حبا ساعدني على أن أعيش مع كل واحدة منهن بعيشتها الصغيرة، وأن أساعدهن على قدر طاقتي. وقد قابلنني بالمثل، فكنت دائما أرى وجوها باسمة ضاحكة وكن يرافقنني في كثير من نزهاتي. وأذكر أني زرت مرَّة إحدى صديقاتي وكانت ابنتها تتعلم عندي ولها اثنتا عشرة سنة من العمر. ووجدت صديقتي في الفراش. فأخبرتني في أثناء الحديث بأنها غضبت أمس على ابنتها إذ قالت لأبيها : إذا ماتت أمي فتزوج معلمتي، فهي تكون لي أما… شعرت بسعادة لم أشعر بمثلها من قبل ملأت قلبي، إذ إن أولئك الصغيرات يحببنني كما أحبهن. وفي وقت فراغي كنت أزور أطراف المدينة، حيث يعيش الفلاحون، وأتفقد أطفالهم الصغار المهملين وقت الحصاد، وكان قلبي يتقطع ألما عندما أرى تلك العيون الملتهبة بالرمد ، فأغسلها بمحلول حامض البوريك، وبعد تنظيفها أنقط محلول الزنك عليها. أظن أن بعض الأطباء الذين لم يجعلهم الزمن آلهة بل ظلَّوا بشرا ، يدركون تلك السعادة التي كنت أشعر بها. عندما كنت أرى بعد أيام تلك العيون سليمة صافية، وتلك الأيدي الصغيرة تطوق عنقي . هذا الشعور كثيرا ما كان ينسيني تعبي ، عندما كنت في ساحة الحرب في البلقان وفي روسيا . ألم أكن سعيدة لتعافي كل جندي، أو لتخفيف آلامه ! ألم يرقص قلبي طربا عندما كنت أزور المريض وأراه متجها إلى الصحة، وأرى عائلته سعيدة لشفائه ؟ بلى إني كنت أحب الجميع فأتألم لآلام كل فرد وأفرح لفرحه، ولهذا لم تشعر نفسي أنها غريبة، مع أن لي مدة طويلة في الغربة. والأمر الثاني، وأهميته لا تقل عن الأول وهو حسباني أن كل عمل شريفا، فلست أخجل من أي عمل كان، ما دام غير ماسِّ بشرفي ولا بشرف غيري. ولا أذكر من قال من الروسيين: ينبوع الحياة في داخلنا. فيا لها من حكمة بالغة. نعم، إن ينبوع الحياة فينا، فإذا قدرنا أن نروي جميع مظاهر حياتنا به، صارت حياتنا وردة زاهرة تتغلب برائحتها العطرة وجمالها على الأشواك التي هي كثيرة جدا في طريقنا. فلا تؤلمنا هذه الأشواك كما لو كانت وحدها. ومن لا يرتوي لا بُدَّ له من أن يقف كالعطشان فتجف حياته وتصير صحراء، والسعادة كالسراب فيها يركض وراءه فلا يصل إليه ولو كانت لديه الملايين. تعلمت أن أجد الجمال في كل ما يحيط بي، طبيعيا كان أو من صنع البشر، فجمال الطبيعة كان دائما يسَكِّن اضطراب نفسي، لأنه رمز الخلود، وأما صنع البشر فإنه كان يجدد قواي ويكسبني إعجابا بعقل الإنسان، فأنكب على العمل كالنملة. فأنا، ولا مبالغة، كنت في جميع أطوار حياتي سعيدة أشتغل راغبة لا مُلزَمَة. This is what summarizes what Shafak has learnt through her journey. And in my opinion, it summarizes the struggle of women who are entangled in the dilema of career versus family. Just remember that only you and your partner know what’s best. Pray for God to show you the right way and the strength to follow through implementing the decision (that’s what Istekhara prayer is all about). And remember that everything goes at its own pace, whether its family or professional achievements. And finally, only you put the standards of being a high achiever, not your family, friends, boss, society. I can’t claim that I work by this rule all the time. Occasionally I pass by severe under-achievement phases, and I truly hate it. But to be honest, I also know that even if I chose career over family, from time to time I would have similar depressive thoughts. So in conclusion, both sides most probably face the same problem, only from different angles, so this entails that there is no one right answer to all. And as Shafak said, every woman will elaborate her own answer to universal questions. I pray that we accept our decisions, and try to fulfill our dreams.